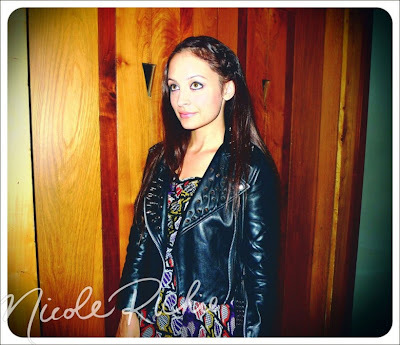 Nicole Richie's leather studded biker jacket is a hot item in her closet right now! She has been seen wearing it to public events, travelling long-haul from London to LA, to the gym and Nicole even blogged about it as her current obsession! Nicole Richie's leather studded rocker-esque jacket is designed by Katie Nehra (pictured below) for her Simone Collection. Katie spoke to Style.Com about the hot right now item you can read the article here. You may remember that I wrote about Katie Nehra back in 2009 as a one to watch and she sure is! Nicole Richie isn't the only celeb fan of the leather stud jacket. It is also a favourite of Mary Kate Olsen, Avril Lavigne and Patti Smith. Click Here to pre order your studded biker jacket, I imagine that this is going to sell out fast!